The Wayne K. and Lyla L. Masur HVAC Laboratory was inaugurated in February 1995 in a ceremony attended by dignitaries from the University of Florida and the local, regional, and national American Society of Heating, Refrigerating and Air-Conditioning Engineers (ASHRAE) community. The Laboratory was founded by Dr. S.A. Sherif, Professor of Mechanical and Aerospace Engineering, employing a significant cash donation from the Masur family. Wayne Masur is a successful alumnus of the Mechanical Engineering Department at UF. The Laboratory serves both an instructional and a research mission. Among its research capabilities is a unique experimental facility designed to study frost and ice formation on industrial freezer coils under ice foggy conditions. The Laboratory also includes an air-conditioning demonstration facility, a cooling tower simulator, an air-water heat pump system, and a chilled-water system with an artificial load simulator. Among the many experimental research projects carried out at the Laboratory, an experimental investigation to develop deployable heat pump units employing rotary vane expanders for the U.S. Air Force has been conducted. Hundreds of students have taken part in different instructional and research activities in the Laboratory since its creation in 1995. Since the inauguration of the Masur HVAC Laboratory in February 1995, several experimental research projects have been funded and carried out. In what follows, a brief summary is provided. Under the sponsorship of ASHRAE and over a 9-year-period, two research contracts and four research grants were awarded to Dr. S.A. Sherif. 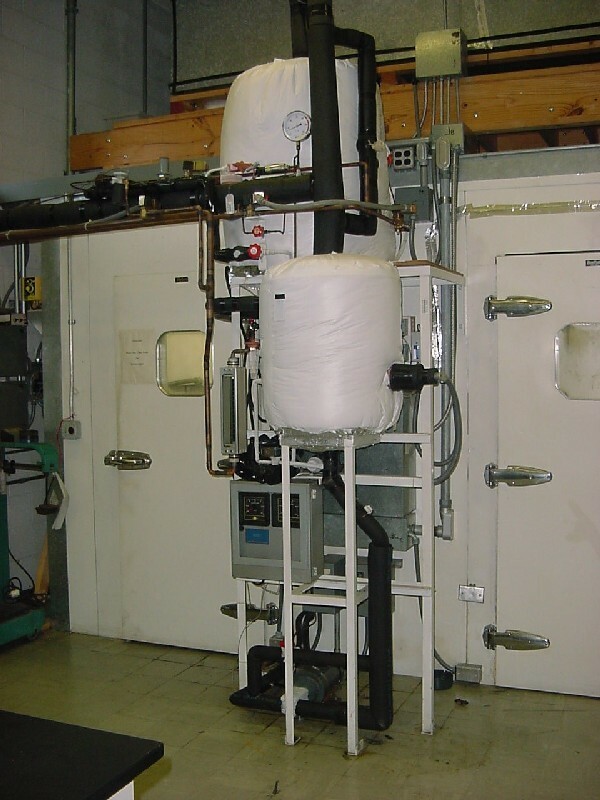 This multiphase/multiyear experimental investigation intended to quantify the heat loads associated with defrosting industrial freezer coils using the hot-gas defrosting method. In order to be complete and reliable, coil-defrosting data must provide the frequency and duration of defrost and must be correlated with the basic refrigeration load in its sensible and latent components. It must also identify the pertinent psychrometric conditions of the complete refrigeration/defrost (R/D) cycle. The first phase of this research identified the importance of applied psychrometrics relative to coil defrosting loads. During that phase a state-of-the-art experimental facility was designed and constructed for that purpose. Results of the testing performed in the first phase indicated the need to operate freezer coils under subsaturated conditions and the need to focus on obtaining coil performance data under those conditions. In the second phase of research, an extensive body of data that addresses the coil-defrosting problem was provided. Of particular significance was the issue of the nature of the frost that forms under supersaturated conditions inside the freezer. Frost forming under subsaturated conditions is fundamentally different in its crystalline structure from that forming under supersaturated conditions, with ramifications pertaining to the energy and time requirements of its removal from the coil surface. It was found that the latter type of formation is more snow-like and is associated with a significantly larger defrost energy penalty than the former type. Several alternative energy conservation ideas such as the use of heat pipe-assisted coils and tandem fan-coil units were also be investigated. New psychrometric charts for moist air in the supersaturated zone of the chart have been developed for the first time. A new section in the ASHRAE 2006, 2010, 2014, and 2018 Handbook of Refrigeration has been added as a result of this research. Under the sponsorship of the Air Force Research Laboratory, Drs. S.A. Sherif and W.E. Lear experimentally investigated the use of rotary-vane expanders in place of expansion valves in refrigeration and air conditioning systems. The effects of varying the ambient/cold space temperatures, design inputs (heat exchanger effectiveness, pressure drops, etc. ), compressor efficiency, and expander efficiency have been investigated for both R-134A and a hydrocarbon mixture. Part of the work involved establishing the efficiency of vane expanders as a function of design and fluid parameters. This necessitated estimating the magnitude of the loss mechanisms including mixing, friction, throttling, and leakage. These losses have been incorporated into a thermodynamic model that yields the change in state across the device as well as the expander efficiency. Under the sponsorship of the Florida Power and Light Company, a one-year study of refrigerant flow control valves for energy conservation has been conducted by Drs. H. A. Ingley and S. A. Sherif at the Masur HVAC Laboratory. The Laboratory provided a temperature-controlled environment to house a Hill-Phoenix refrigerated cabinet for the duration of the evaluations. The case was outfitted with data logging systems to monitor temperature and power consumption and demand for the compressor and cabinet electrical systems. Under the sponsorship of Siemens Corporation, a two-year study of sensor design, construction and implementation was conducted by Drs. H.A. Ingley and David W. Hahn at the Masur HVAC Laboratory. The sensors were designed specifically to monitor the environmental conditions in laboratory animal cages. The sensors were later integrated with a building automation system to provide an indicator of environmental conditions (temperature, humidity, and ammonia and carbon dioxide concentrations) that might adversely affect animals housed in research facilities. Under the sponsorship of Florida Power and Light Company, Dr. S.A. Sherif conducted a study to investigate the effects of employing the Ion Collider technology in refrigeration systems. The study covered two main categories of tests dealing with the effects of using Ion Colliders in the presence of both new as well as old/used refrigerants. The study included testing two types of colliders corresponding to different collider compositions. Under the sponsorship of NASA and over five years of research, Drs. W.E. Lear and S.A. Sherif were awarded three grants to perform laboratory investigations of both a two-phase jet pump and a capillary-pumped thermal management system for spacecraft applications. The new idea here is to use a jet pump instead of a vapor compression pump, and a capillary pump instead of a mechanical pump. A jet pump is a pair of concentric tubes, in which the center tube consists of a nozzle of a high-pressure jet of fluid. The jet action creates a low-pressure suction at the nozzle opening. The jet pump has been used in large industrial air conditioning systems, primarily with the working fluid being steam. A capillary pump is a small pore diameter material that uses capillary forces to maintain a pressure difference created by evaporation on one side and subcooled liquid on the other. Such devices have already flown successfully in space. Under the sponsorship of Florida Power and Light Company, Drs. D.Y. Goswami and S.A. Sherif conducted an experimental study to evaluate some spray agents in evaporative air conditioning applications. Under the sponsorship of Florida Power and Light Company, Drs. S.A. Sherif and D.Y. Goswami conducted a study to evaluate the effects of subcoolers, intercoolers, and liquid-to-suction heat exchangers on the performance of refrigeration and air conditioning systems. Under the sponsorship of Florida Power and Light Company, Drs. D.Y. Goswami and S.A. Sherif conducted an experimental study to evaluate the effects of the level of charge under field conditions of the performance of air conditioning systems. Under the sponsorship of the Florida Energy Office, Drs. D.Y. Goswami and S.A. Sherif conducted an 18-month experimental study in which they remotely monitored the experimental performance of a government building in Tallahassee from the Masur HVAC Laboratory. Under the sponsorship of ASHRAE, Dr. S.A. Sherif conducted an experimental study to investigate the performance of a solid desiccant cooling system with a solar regeneration capability. Under the sponsorship of Florida Power and Light Company, Drs. D.Y. Goswami and S.A. Sherif conducted an experimental study to evaluate the effects of refrigerant blends and additives on the performance of refrigeration and air conditioning systems.